It’s a matter of preferences, but I’m all about mom jeans. Pure Levis 90’s aesthetic, mom jeans are the perfect vintage casual denim cut. High waisted, larger on the legs, they are super comfortable. They will keep you warm in winter and somehow always keep you cool (pun intended). Finding the right pair of jeans, mom fit or not, is an essential in any wardrobe. 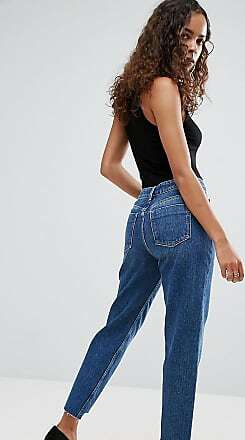 Some will prefer skinny, boyfriend, boot cut etc and others like me will be all about the mom jeans. The great thing about finding what works for you is that it makes you feel beautiful. It should be thick, no stretch. With vintage denim, you can have some “jeggings” elastic kind of material. It has to be real denim and it will feel amazing, especially after you break them to fit you perfectly. The main reason why some people find vintage denim uncomfortable. But if they feel too tight on your regular size, then go a size up. They should be looser on the legs, you’ll see, you won’t want to wear anything else after. Let the denim do the work and highlight your curves (small or big) the right way. If the waist is too large, get it fitted or add a stylish belt. But do not get a pair that is too skinny or it will go against the style of jeans. To keep this style chic and modern, forget about any kind of embellishment. Especially if you are not a teen anymore. Avoid ripped fabrics, bi-colour, pearls etc. Keep your denim as simple as possible. It should fit you perfectly and like anything Parisian style, less is more. Your outfit will look extremely stylish and yet so casual. Claro, un accesorio puede totalmente cambiar el look !